Media PCs exist in a tricky limbo between the PC and the set-top box – do you choose a full remote keyboard with a built-in mouse or trackball, or a wand-shaped remote control, perhaps with a built-in trackball? The GlideTV Navigator is another approach from the PC side, a touch-pad mouse that fits your hand and provides essential functions along with shortcuts to your favourite applications and websites. It also works with the PS3, but not the Xbox 360. The Navigator is operated by your right-hand's thumb, and the central touchpad is also clickable as your left mouse button. It's surrounded by eight buttons that operate as cursor keys and the ESC, Enter, Backspace and right mouse buttons. There's also a search button, volume and playback controls, and a power button if your PC is set to power up via USB command. Finally, the Glide TV button activates the Glide TV Navigator software. 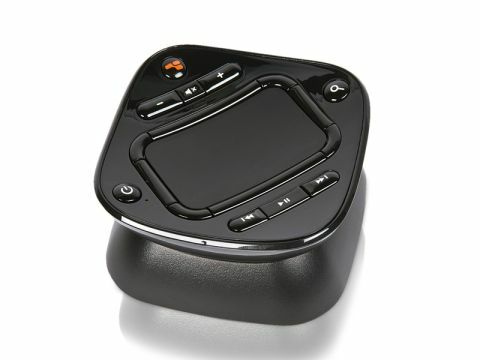 It fits into a small recharging cup and communicates with your PC by the 2.4GHz wireless dongle. It's easy to hold, but unless you have large hands it's a little too large to reach all the buttons comfortably without shifting it around. The touchpad itself takes some getting used to, and the cursor can shoot off-target just as you click a button. The playback buttons work with applications including Windows Media Player/Media Centre, and VLC, provided they obey the standard keyboard shortcuts like using the Spacebar to pause/play – so it won't work with BBC iPlayer. You can set up the Navigator software to quickly access favourite applications and websites, although it's easiest to do this with a standard keyboard and mouse. Certainly it's a simple way to perform a lot of basic tasks like web-browsing, playing files and changing channels, as you do with a media PC. You can scroll around pages using the edges of the touchpad. However, the final judgement is very personal. It's too large and a little tricky to control – I prefer a trackball and trigger buttons to a touchpad. On the other hand, it makes it possible to abandon my large wireless keyboard/trackball combo for most tasks, and I can even log in using soft keyboard.